SURI STUD MALES. SURI STUD MALE ALPACAS at Spring Farm. 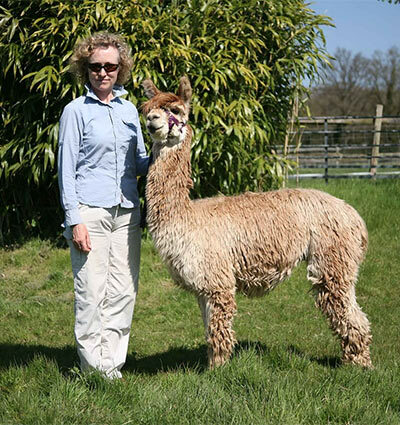 We have always strived to include the best genetics in our alpaca breeding program by utilising the very best stud males – in both huacaya and suri – available to us. To further enhance our breeding program, we have selected from amongst the worlds best suri genetics culminating in world class blood lines from MacGyver, Torbio, Helios, Bruxo, Ganador, Uribe, Moon River’s Durango and Travatore. These suri stud males are a roll call of outstanding suri genetics and are now available in the UK both through Spring Farm and in the case of our shared males with West Wight Alpacas, via our joint venture: Suri Stud. We first saw Tailor Made in the Suri Light Male Class at the 2018 BAS Nationals. Tailor Made won his class and then went on to win Champion Light Suri Male. Then in the Championship line up against a number of the UK's best suris, Tailor Made won Supreme Champion! Needless to say we were seriously impressed and bought Tailor Made for Suri Stud - our joint venture with Neil and Michelle Payne from West Wight Alpacas - in the Summer of 2018. Tailor Made has all of the positive traits that we aspire to reproduce in our breeding programmes. 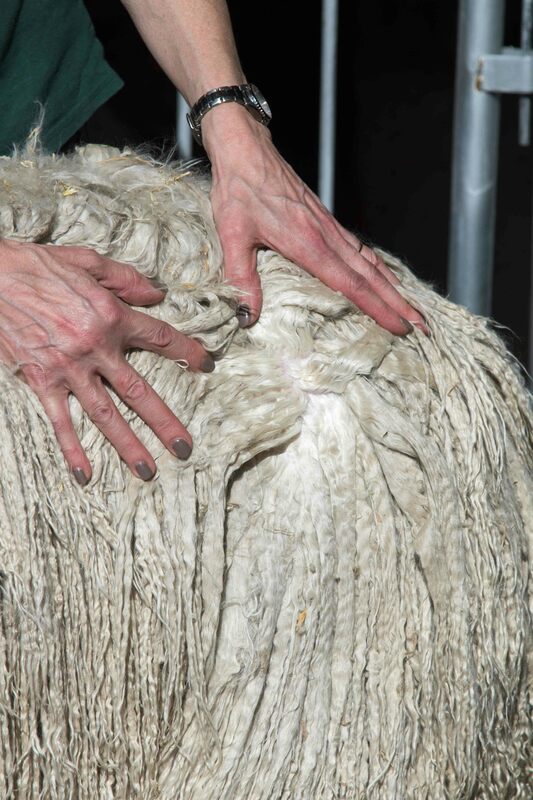 On a solid true to type balanced and compact frame his fleece is dense, fine, uniform and with a high degree of lustre. Houghton Hall imported Tailor Made's sire Travatore from New Zealand for his exceptional quality of fleece and outstanding breeding. Travatore's progeny have excelled in the UK showring since arriving in the UK but Tailor Made is the only son of his to have won Supreme Champion at the BAS National Halter Show. We have high expectations for Tailor Made's first progeny who are due in 2019. Houghton Mason's sire is Accoyo El Cordoba. We bought Mason alongside Tailor Made from Houghton Hall within our joint venture - Suri Stud - which we co-own with Neil and Michelle Payne at West Wight Alpacas. Mason's cria Houghton Monopoly took first place junior white suri male and then went on to take Champion White Male at the BAS National Show 2018. 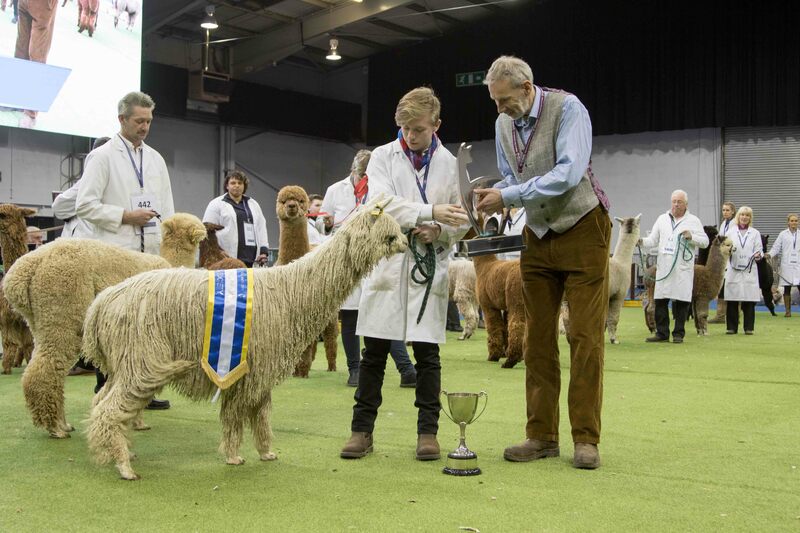 Since the Nationals, Monopoly has secured first junior white male suri at the 2018 Spring Alpaca Fiesta as well as the 2018 South of England show. 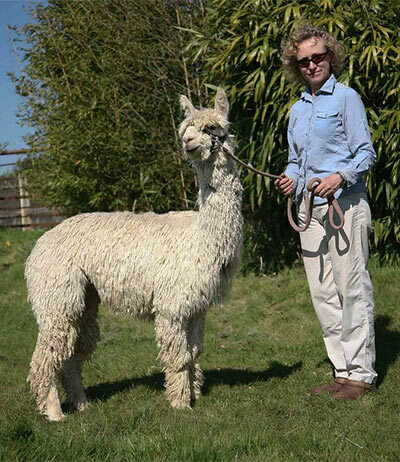 At the Eastern Alpaca Group in October 2018, he took first place white male (this time as an intermediate) and then progressed to Champion White Male Suri and Suri Supreme Champion! We have high expectations for Mason's first progeny who are due in 2019. Wow! Rapper is an extremely striking and phenotypically correct suri. His lustre stands out even on a dull day and is very evident on opening his fleece. 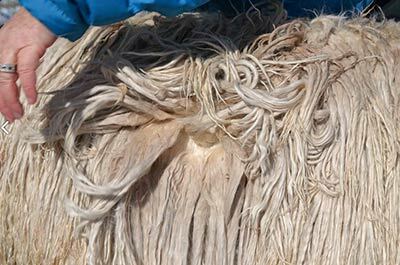 His exceptional lock structure together with this lustre was what made him stand out while being selected, but the density and handle to his fleece are also very impressive. 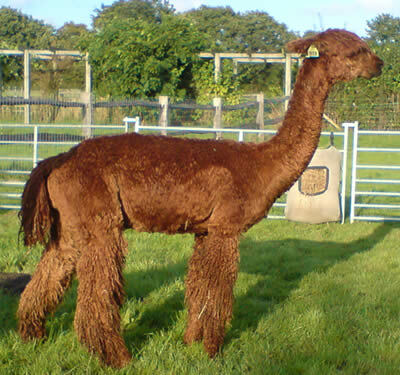 His sire (Moon River’s Peruvian Durango) was sought by experienced and successful suri breeders – Pucara Alpacas of America. In 2007, before he started the process of travelling to the UK, he attanded 4 shows in the US as a junior. He received three 2nd places rosettes and then went on to the AOBA Nationals where he was 1st in his class and took the Brown Suri Male Championship out of a total entry of 69 brown male suris! Since joining our stud team, Rapper has consistently produced brown and fawn cria who have themselves gone on to win Championships in the UK. Springfarm Krug taking Champion Brown Suri Male at the Futurity 2011, Reserve Champion at the Futurity 2012 and again in 2013! Springfarm Kaiser took Reserve Champion Brown Suri Male at the Futurity 2011 and swapped with Krug to take the Champion Brown Suri male at the 2012 (now retired to stud so not available to challenge in 2013)! Rapper is consistently producing show winning cria and at the 2013 Futurity only 9 crias of his were entered and placed as follows: 1,1,1,1,2,2,3,4,5 plus 2 Reserve Championships – contact us now to add his genetics to your herd. Rapper then went on to take BAS National dark herd sire of the year 2014! Rapper continues to produce stunning cria. At the BAS Nationals in 2019, Rapper's cria took 3 First place rosettes, 1 Fourth place rosette and his cria - Springfarm Toreador - went on to take Champion Brown Suri Male. First of all, Aslan is a fawn Macgyver son – this alone should be enough to stir your interest! As such, he was retained by his breeder rather than being sold – since most of Macgyver’s offspring were darker than himself. Also, being a fawn champion, Leslie Loveless (his breeder) was keen to keep hold of him. More so, on his dam Sonata’s side (a multi level five champion in her own right) you have Macgyver’s brother Helios. Helios and Macgyver in their day spent time swapping colour championships between them. With this ancestry he obviously has Bruxo on both sides but he also has Ganador and Uribe on his dam’s side. Aslan now has progeny on the ground in the UK - please ask to see his progeny if you are interested in quality suri genetics. Aslan's progeny are continuing to dominate the BAS National Show with Aslan winning Dark Herd Sire of the Year 2016 - having first won it in 2015!! Did we mention that Rapper won it in its inaugural year in 2014! Aslan's cria continue to stun the judges...at the BAS National 2019 they took 2 First places, 2 Second places and then one Champion and one Reserve Champion. Aslan was born in June 2005 so we imported him as an eight year old. For the Suri breeders among you, you will realise that just getting him through UK screening was quite an achievement for a suri of his age. 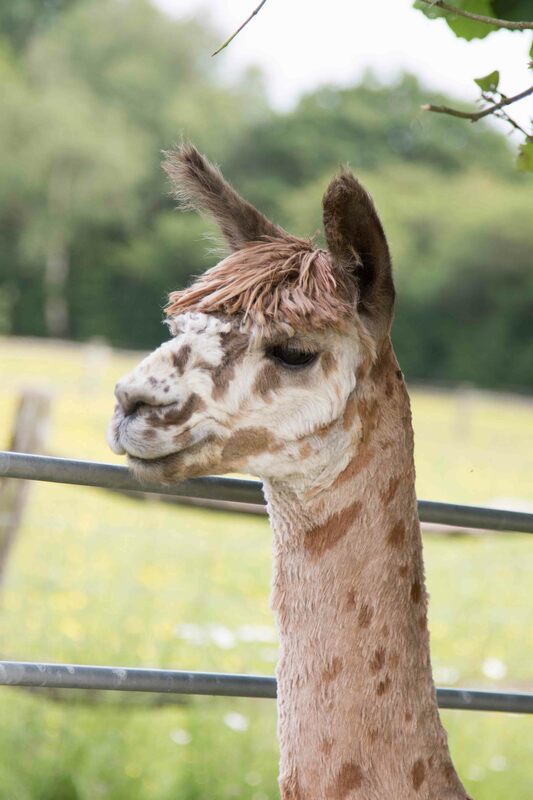 Aslan is jointly owned by Spring Farm Alpacas and West Wight Alpacas. Please contact us or see http://www.suristud.co.uk/ for more details. His fleece stats were taken in May 2013. Silver Rider is a unique opportunity to obtain a suri mating to the only silver grey son that Macgyver ever produced. Sadly, Macgyver passed away, aged 16, in 2013, so this makes Silver Rider even more special. His dam, Lirope, was an original import from Peru to the United States. She consistently produced quality cria with Championship winners amongst them. 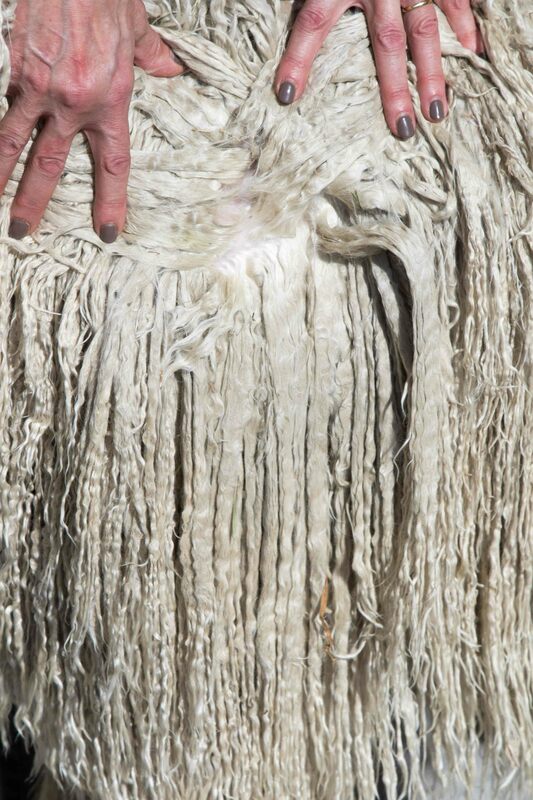 Silver Rider has a lustrous and dense fleece with an excellent handle. His fibre statistics are highly creditable given his colour. All of his cria born to date in the United States have been grey! This is one very special male! Born in February 2009, we hope he will have a long breeding career, hopefully producing many grey crias. Silver Rider is not UK screened meaning that his cria will need screening in the UK – which is allowed within the BAS rules. Silver Rider is not currently open for outside breeding however we hope to be able to offer screened and registered cria from him in 2015. If you are interested in grey suris then please contact us. 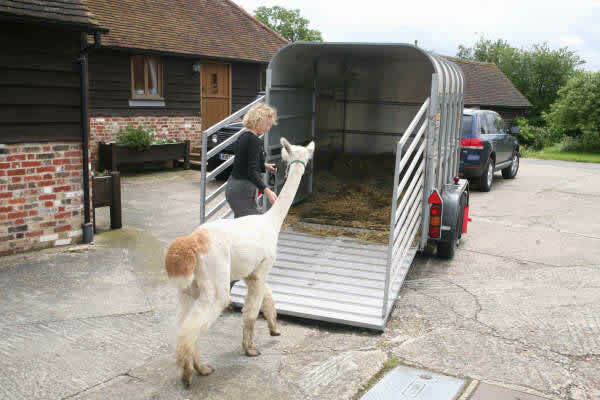 Silver Rider is jointly owned by Spring Farm Alpacas and West Wight Alpacas. Please contact us or see http://www.suristud.co.uk/ for more details. Lensky is an appaloosa suri stud male alpaca - a very rare breed! Although Lensky was not born here at Spring Farm, his dam and sire are both Spring Farm alpacas. We could not resist adding him to our stud male list given both his highly unusual coloration and the genetics he combines. His sire is Alfonzo who is featured below on this page and needs little introduction. His dam is Springfarm Mishka who is a Rapper daughter. Lensky's genetics therefore combine Torbio, Snowmass Ice Dancer, Rapper and Suri Classic Dream! 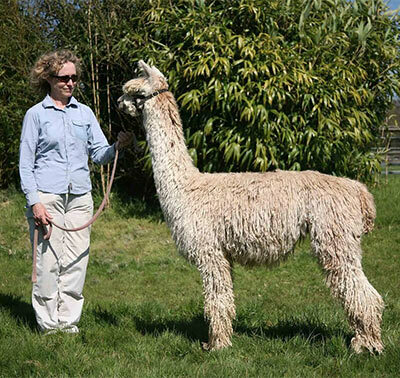 Lensky is jointly owned by Spring Farm Alpacas and West Wight Alpacas. Please contact us for details of mating fees or see http://www.suristud.co.uk/ for more details. When we first saw this male at just over a year old, he was still in his first fleece – which was hugely dense and uniformly locked on this tremendously well built young male. 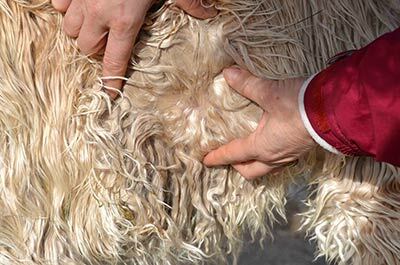 He has a highly lustrous fleece that organised itself into locks once again very quickly after shearing. 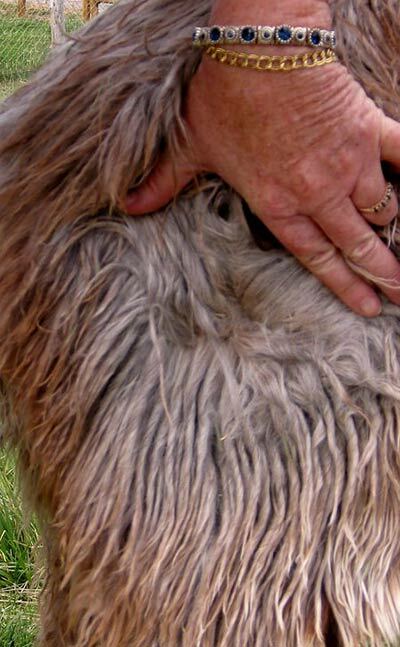 His first fleece was so dense that his locks were almost flat close to the skin. Amadeus is a full Accoyo and his sire, LCA Accoyo Rico, has both Inca and Bruxo in his pedigree. On his dam, Snowbelle’s side, she has Uribe, Apache II and Bruxo again. Leslie Loveless (his breeder and former owner of Macgyver) really rated LCA Accoyo Rico and she paid $6000 at auction for his mating as he was closed for outside matings at the time. Amadeus is not currently open for outside breedings as we have taken the decision to prove him first. His first few cria will be on the ground in late 2014 with many more in 2015. If you think you may have an interest in Amadeus in the future please contact us for details. 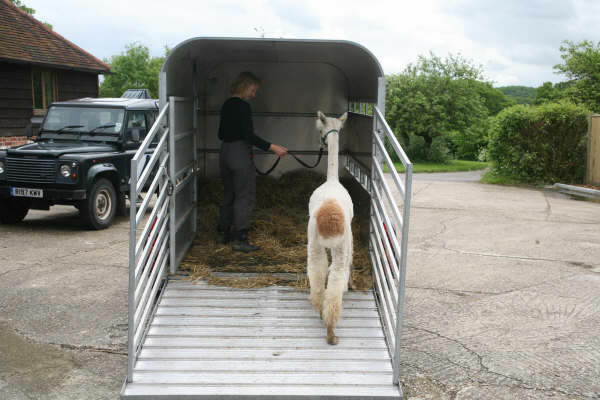 Amadeus is jointly owned by Spring Farm Alpacas and West Wight Alpacas. Please contact us or see http://www.suristud.co.uk/ for more details. Victor’s sire is Sniper, a true black Macgyver son. 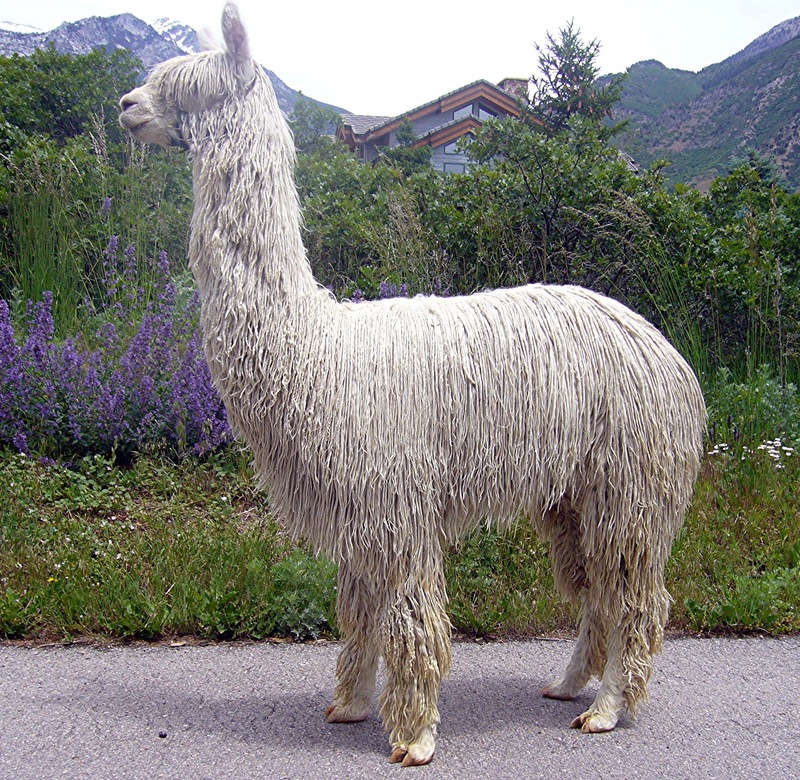 Sniper is the most decorated coloured suri alpaca ever in the USA to date. When we first looked at him he was quite a young cria. Our first impression was knockout lustre, he was showing density and he was very, very fine. We did not look at him again until he arrived in the UK and he was in his second fleece. We were delighted that he was showing the fabulous structure that we are all looking for in our suri fleeces, and he had maintained a good level of fineness and that fabulous lustre that originally drew us to him. Victor did not work in 2013 because of his age, however we know he will be keen this year so we should have cria on the ground in 2015 and his offspring will be shown in 2016. He has in his pedigree Bruxo, Macgyver, Ramases, Uribe and Accoyo Gold. His dam PSR Peruvian Persnickety has produced a number of champions and has been a fantastic producer for her US owners. 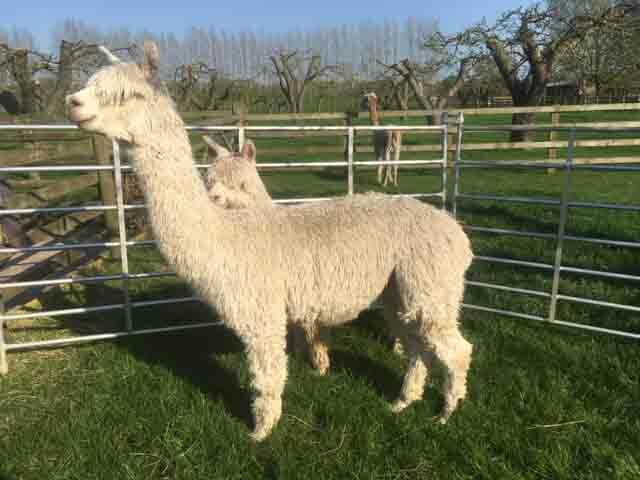 Victor is jointly owned by Spring Farm Alpacas and West Wight Alpacas. Please contact us or see http://www.suristud.co.uk/ for more details. His fleece stats are from his second fleece taken in May in 2013 and he is holding his original fineness well. Springfarm Alfonzo's Obelix (Obelix) is a solid mid fawn suri stud male. Obelix's sire is Alfonzo who is featured below. Alfonzo is a multi award winning white suri stud male who whilst in the US prior to our import took Judges Choice at the 2009 AOBA National Conference in a show of 800 suri alpacas!! He is unfortunately no longer working. Obelix's dam is Springfarm Josephine who was Champion fawn female at the South of England 2010. 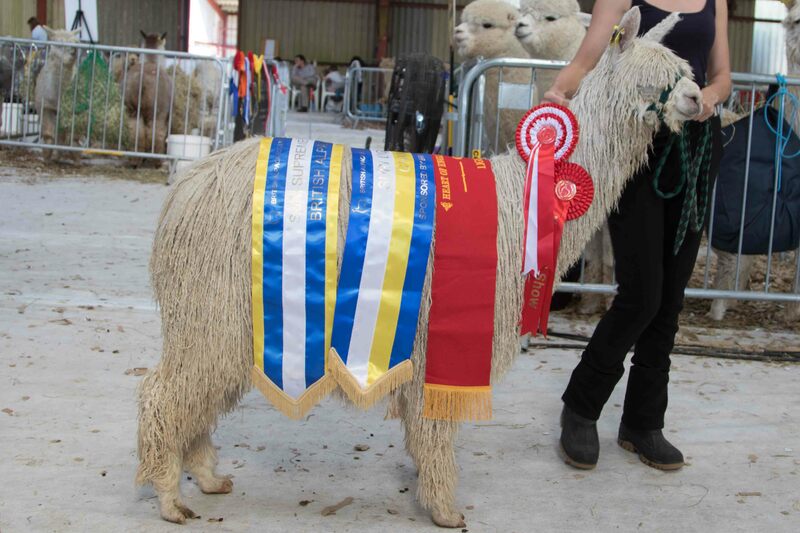 She took first place at the Heart of England 6-12m fleece show, then first again at the 2012 Futurity (12 - 24m) and first again at the 2013 Futurity (24 - 48m). 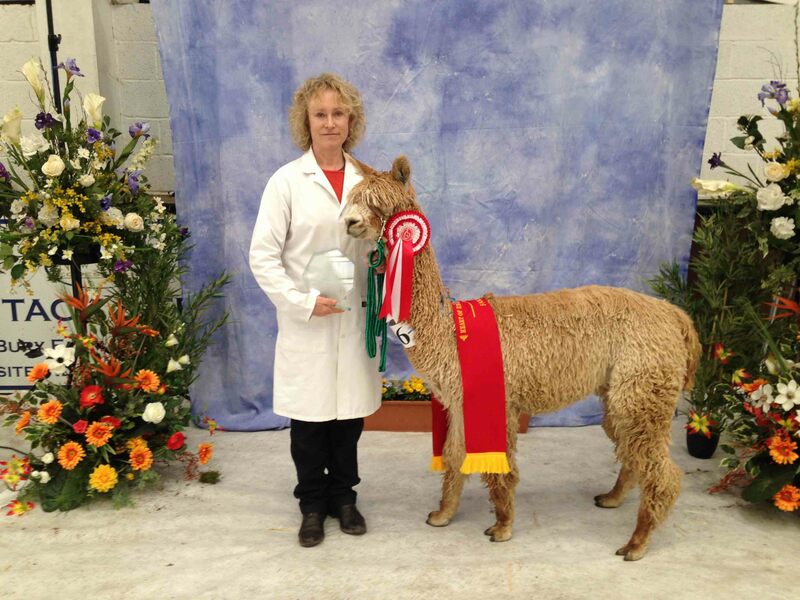 Josephine's sire is Inca Fusion who was Suri Herdsire of the Year at the 2011 British Alpaca Futurity! Obelix worked for the first time in 2017 and we await his first cria in 2018. Alfonzo is a multi award winning white suri male born in September 2007. 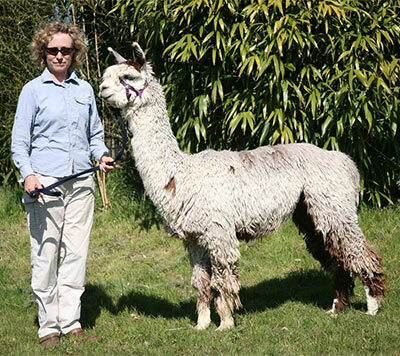 We purchased him from Alpine Suri Alpacas who also own his sire: Torbio’s Maserati. Alfonzo’s grand sire – Torbio – was one of the eight males in the 2P Accoyo Peruvian import of 1994. This import from Don Julio Barreda’s Accoyo herd included many of the most famous names in suri genetics. Alfonzo’s sire, dam and grand dam (Peruvian Capellini) are outstanding suris which we can vouch for having seen them in person in the USA. Torbio’s Maserati, Alfonzo’s sire, is a multiple champion in both halter and fleece shows. Coming from a very small herd, in his first year as a stud male, Torbio’s Maserati produced four colour champions, including Alfonzo who took judges choice at the 2009 AOBA National Conference in a show of 800 suris!! Alfonzo has tremendous presence, great substance of bone and is well balanced in his conformation. 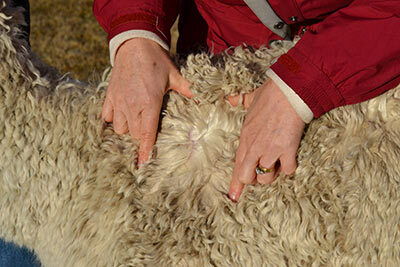 In terms of his fleece, he has extreme lustre with a wonderful handle. He has dense, well defined and uniform locks throughout his entire body, legs and neck. Please note, Alfonzo is no longer available but his genetics are available through Obelix and Lensky - see above - and his offspring sometimes become available - please contact us for details.